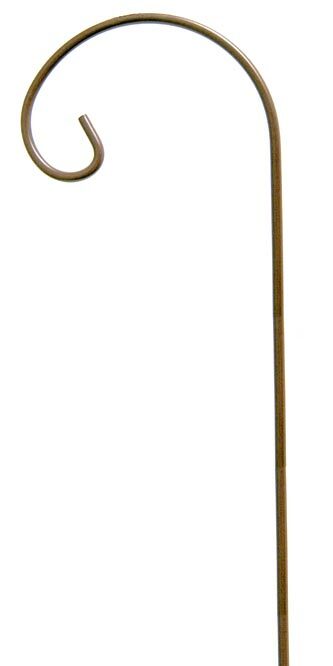 Hang wind chimes, flowering baskets, or bird feeders in the middle of your lawn with the Panacea Shepherd Hook with Inside Curl. This hook will help you achieve both bird feeding success and backyard beautification. It beautifully displays hanging feeders, as well as outdoor lanterns, spinners, or other crafts up to 18" in diameter. This hook features an additional inward curl at its culmination for a gentle look. Use the convenient "step-in" base to anchor this item 11.25" into the ground. The powder coated finish protects the item from the elements, while the brown color adds a natural feel. The sturdy steel construction will last for several seasons for a beautiful garden center. Enjoy your garden for years with the Shepherd Hook with Inside Curl. Made in the USA. Capacity: up to 12 lbs.